​At Red Pines Bar & Grill, you'll find a little something for everyone, from sensational starter appetizers to tasty entrees, sandwiches, pizzas and wraps. Our restaurant in Onalaska is the only place to be for fantastic flavors, and unbeatable service! But that's not all. In addition to irresistible food and a huge menu, our family restaurant also provides a great place to hang out, play some volleyball, or relax during happy hour with friends. Come see for yourself why our Onalaska, Wisconsin, family restaurant needs to be your destination location for both entertainment, craft beers and outstanding pub fare. Every month we will have a calendar of events created for our guests. We look forward to you enjoying these events with us. 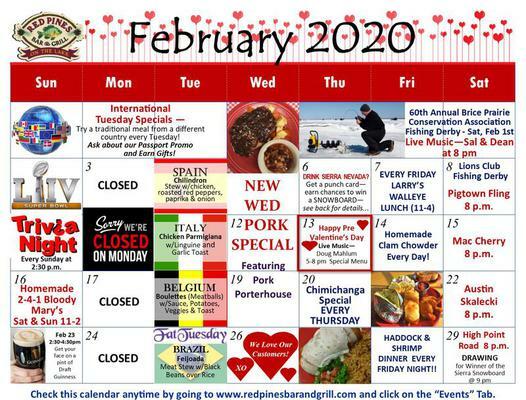 Check out our Tuesday International Specials with a different style homemade cuisine each week. 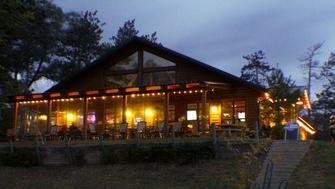 If you have suggestions for events that you would like to see at your Red Pines please let us know! For more information about us visit our information page. Escape to the "Northwoods" of Onalaska. Great Food - Always a Good Time! Sit out on our deck or in our new addition and check out the wildlife.